Ichche Nodi Star Jalsha Serial Song. 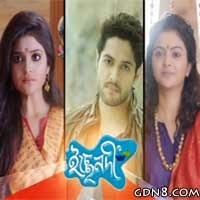 Maa TV Serial Heroine Jhilki(Sreetoma Bhattacharya) Starting A New Serial Ichche Nodi on Star Jalsha. This Serial Starts On 15th June 2015 Mon-Sun at 5:30 pm. This Serial Title Song Sung By Madhuraa Bhattacharya.